"Your Checklist For A Successful VR App Development Project"
"Enhancing Home Automation Solution Using IoT for Home Devices"
An ever-increasing usage of smartphones demands omnichannel enterprise fulfillment services to cater the on-the-move needs of enterprise users. Enterprise mobility holds countless opportunities, however, this mobile shift has caused a lot of agitation to the enterprise mobile app developers. 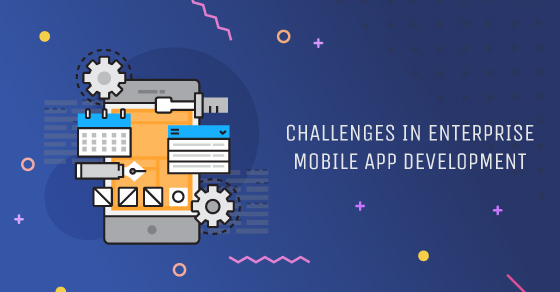 Let’s have a look at few challenges on the path of developers. In today’s time of fast-paced developments in OS and hardware technology insists mobile app developers need to be updated to find an absolute relevance. To remain on their toes enterprise app developers has constantly need to track down with the ever-emerging technologies. As the number of devices increasing in the today’s market practically makes a hard choice for developers is on deciding which device to test the app for a seamless usage on all platforms. UX or User Experience is the key to make your app delightful. enterprise users value simplicity with a minimalist approach. Therefore, the real challenge in enterprise app development is to develop a robust feature packed app to meet the business branding with a seamless UI. Incorporating the app with analytics to track the engagement metrics, a constant monitoring crash logs, having a structured feedback mechanism, etc is another hard time setting up for the developers. When it comes to securing data stored on the device it’s hard to synthesise the actual degree of security required. Because every operating system has a discrete architecture and independent mobile platforms to grant dynamic levels of support. You can either encrypt your data by saving in a safe folder within the device or, you can integrate with the enterprise’s LDAP directory. For an enterprise app the access to enterprise data is a critical parameter for creating powerful enterprise mobile apps. Corporate data usually occupy the backend database hence it is an important woe to manage the data stored in the device in order to access while online. In certain cases, the app is not only required to have data storage potentials but also needs synchronization potentials. This in turn demands an integrated and flawless sync of all data between the enterprise app and the database. Another major challenge for develops is packing together various distinct content types into monolithic expansion files for uploading on different app stores. The success of an enterprise mobile app development does not merely lie in developing the app, but also ensuring a trustworthy and authentic communication platform. As many business verticals started keeping a keen on enterprise mobile app development tremendously flourishes the market for the Enterprise solution which in turn makes overcoming all challenges faced during the app development process into a noteworthy mode.